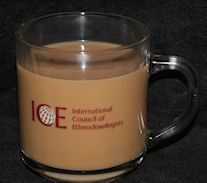 Celebrate your ICE membership with a satisfying hot beverage in this attractive, microwave safe, 10 oz clear glass mug. Buy 3 and we’ll send you a 4th mug for free! Celebrate your ICE membership with a satisfying hot beverage in this attractive, microwave safe, 10 oz clear glass mug. Great for gifts or your own arts gatherings - $10.00 each (or buy 3 and we'll automatically include 1 more mug at no cost. Buy 3 - Get 1 Free).